Pima Community College flew east to Arkansas to be apart of the National Championship tournament. On March 21, one day after falling to Kansas City (KS) Community College in the quarterfinals, the No. 6 seeded Aztecs responded with a 110-90 upset win over No. 2 North Iowa Area Community College. They will play one final game on Saturday in the fifth place match-up. The Aztecs held the lead for the entire game. Alyssa Perez ended the first quarter scoring a three-pointer to give the Aztecs a 23-15 lead. Pima took their first double digit lead at 38-26 mid-way through the second quarter. The Aztecs closed out the first half on a 15-7 run to take a 53-37 advantage. Shauna Bribiescas led the Aztecs with her 13th double-double as she finished with 25 points and 11 rebounds. She went 9 for 12 from the field and 5 for 7 from long range. Hallie Lawson went 11 for 16 from the field and scored 22 points. The Pima bench scored 34 points. Perez finished with 15 points, nine rebounds and five assists while freshman Haile Gleason also contributed with 15 points on 5 for 8 shooting and 3 for 6 from three-point range. Jacqulynn Nakai fell two assists short of a triple double as she finished with 14 points, 10 rebounds and eight assists, and RyLeigh Long had 11 points and four assists. The Aztecs shot 57.5 percent (46 for 80) from the field as a team and out-rebounded the Trojans 46-25. The Aztecs also had 24 assists. On March 20, The No. 6 seeded Aztecs fell to No. 3 Kansas City Kansas Community College Blue Devils 82-68 and will now play in the consolation bracket game on Thursday. Down 74-52 with 6:07 left in the game, the Aztecs continued to claw and went on a 16-4 run in five and a half minutes to cut it to 78-68 with 1:29 left. The Blue Devils scored the final four points of the game to close it out. 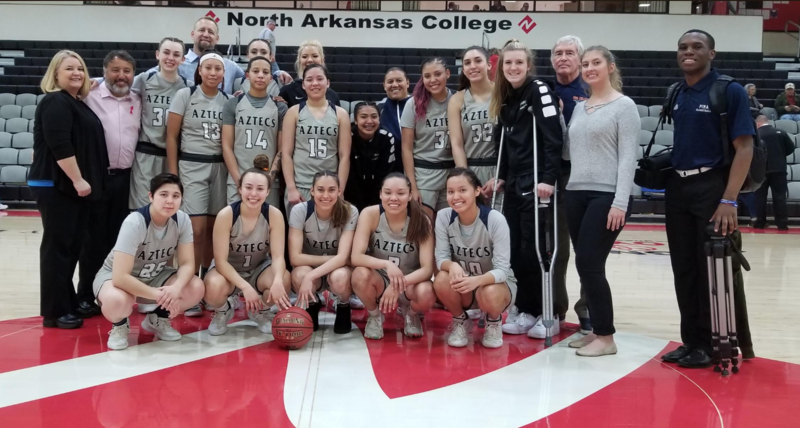 The Aztecs struggled with keeping the Blue Devils off the offensive glass, as Kansas City opened the second quarter on a 12-0 run and put the Aztecs in a 25-13 hole. The Aztecs were outscored 23-7 for the quarter and trailed 36-20 at the half. The Blue Devils had 12 offensive rebounds in the first half and finished the game with 16. Jacqulynn Nakai scored a game-high 32 points on 10 for 23 shooting to go along with eight rebounds, six steals and four assists. She scored 13 of Pima’s 16 points during a stretch in the third quarter. Hallie Lawson finished with 10 points on 3 for 4 shooting while Alyssa Perez fell short of a double-double with nine points and eight rebounds. Shauna Bribiescas had eight points. On March 19, The No. 6 seeded Aztecs rallied to beat No. 11 seed Lake Michigan College Red Hawks 81-79 in the first round of the tournament. The Aztecs led 79-76 with 44 seconds to play. After a Pima turnover, the Red Hawks missed a three-pointer and freshman Haile Gleason pulled down a huge defensive rebound. She was fouled and converted on both free throws to make it 81-76 with 20.8 seconds left. The Red Hawks hit a three-pointer to make it 81-79 and called a timeout at the 14.5 second mark. The Aztecs turned the ball over on the inbounds and forced a missed three-pointer at the buzzer. The Aztecs trailed 63-54 with 8:47 left in the fourth quarter but Shauna Bribiescas helped spark an 8-0 run in two minutes to cut Lake Michigan’s lead to 63-62. Down 70-68, RyLeigh Long hit a three-pointer to give the Aztecs a 71-70 lead with 3:31 left. The Aztecs turned it into a 9-1 run to take their biggest lead of the game at 77-70 with 1:56 remaining. Bribiescas scored 12 of her 16 points in the fourth quarter and secured her 12th double-double of the season as she finished with 11 rebounds. Jacqulynn Nakai finished with a game-high 25 points to go along with eight rebounds. She went 9 for 15 from the field.